The spire of Paris’ iconic Notre-Dame collapsed Monday evening, quickly followed by the entire roof, as a fast-moving fire has torn through the 850-year-old cathedral, devastating France’s famous landmark as large segments of the roof have gone up in flames. French President Emmanuel Macron postponed a televised speech to the nation to rush to Notre Dame, which has been undergoing restoration work worth $6.8-million in recent months. Fire fighting services are doing all they can to bring the fire under control. The area around the cathedral has been cleared. The fire has spread to the north tower. As soon as the fire was noticed early Monday evening, the building was evacuated. Junior interior minister Laurent Nunez confirmed nobody was injured. No members of the public were in the Cathedral as it had closed for the evening. UPDATE 23H00: Sadly one firefighter has been “seriously injured” according to France 24. France 2 television reports that police are treating the incident as an accident. It is reported by local French media that the fire broke out in the attic, and officials say it could be linked to the restoration work. The Notre Dame is one of the most visited monuments in the world, a UNESCO World Heritage Centre attracting millions of tourists every year, particularly this week as Christians get ready to celebrate Easter. A Notre Dame spokesperson said: “Everything is burning, nothing will remain from the frame.” The frame is wooden. The vault is also be threatened. 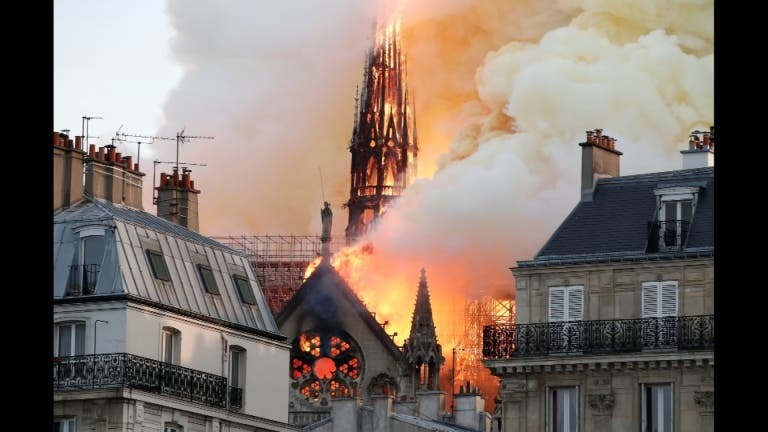 It’s believed that many (although not all) treasures, including art relics and religious artefacts, have been saved – some were removed before the renovations began, and others were taken out of the Notre Dame this evening as soon as the fire took hold. The cathedral, which dates back to the 12th century, features in Victor Hugo’s classic novel “The Hunchback of Notre–Dame“. It’s also famous for being the very centre of Paris, with an X marking the spot from which all distance to Paris is measured. Just last month ‘French Spiderman’ Alain Robert (56) scaled a skyscraper in Paris to raise funds for the renovation. This evening residents and tourists around Paris posted photos as a huge plume of smoke wafted across the city. Ash fell over a large area. It’s not yet known how polluted that smoke may have been. It may have contained lead. The damage is huge and firefighting efforts are expected to continue through the night. 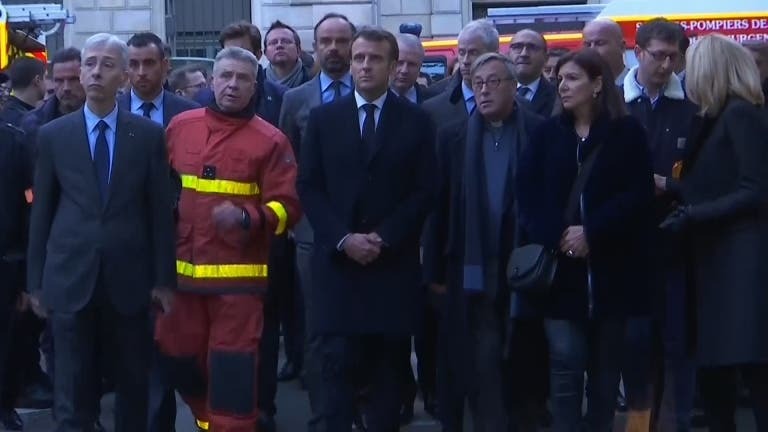 US President Donald Trump suggested that firefighters use flying water tankers… but the French Civil Security service said this is not an option as it may destroy the entire building. 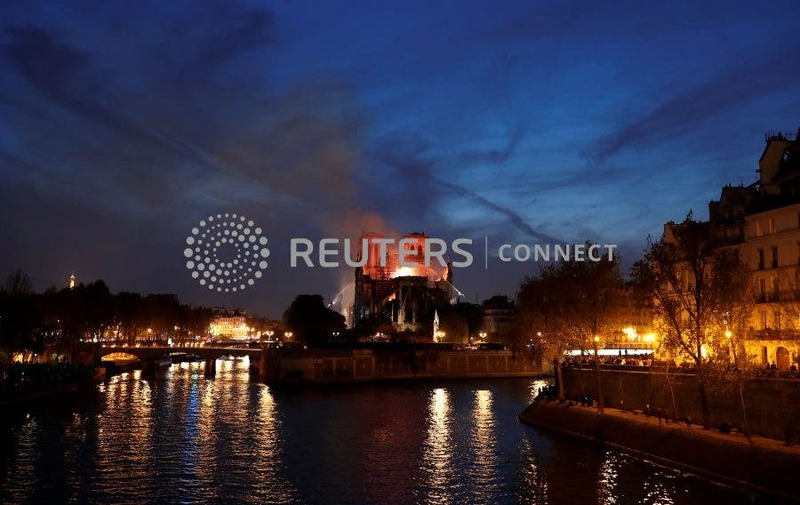 “Helicopter or plane, the weight of the water and the intensity of dropping it at low altitude could weaken the structure of Notre–Dame and cause collateral damage to surrounding buildings,” it tweeted. 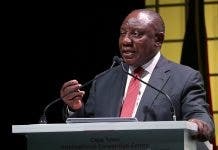 Many foreign leaders sent messages of support including German Chancellor Angela Merkel and British Prime Minister Theresa May. Merkel called the cathedral a “symbol of France and our European culture”. The next 60 to 90 minutes is going to be crucial say firefighters to determine if they can save anything. Hundreds, if not thousands, of people have gathered along the River Seine, to share their pain and be with fellow Parisians as they witness this devastating moment in French history, watching a beloved building that has withstood so many battles, the French Revolution, and world wars burn down… Paris is weeping tonight. UPDATE 23h00 – The Worst Has Been Avoided! : The ‘totality of the structure’ has been saved and both towers should survive! The fire is now under control and they’re working on cooling the Cathedral down. Sadly, one firefighter has been seriously injured. Built over a century starting in 1163, Notre–Dame is considered to be among the finest examples of French Gothic cathedral architecture.